The Master of the Magdalen Legend was given his name by Max Friedländer, who established his oeuvre on the basis of two panels with depictions of the Magdalen, one now lost and the other in the Philadelphia Museum of Art. The artist was active in Brussels in the late 15th and early 16th centuries. Colin Eisler attributed the present painting to this artist, albeit with some reservations given that it had previously been attributed to French and German painters influenced by Flemish art. 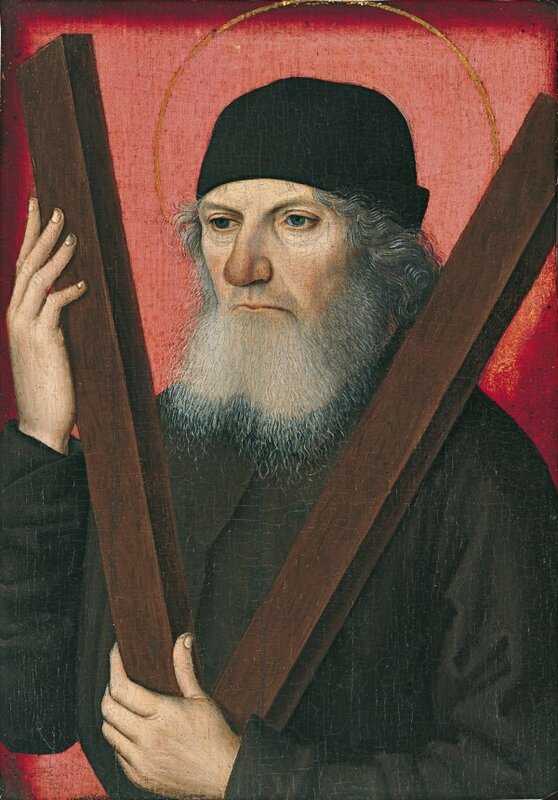 On the front of the panel, against a red background that emphasises the composition, is a portrait of a man with the cross of Saint Andrew and a delicate halo. Portraits of this type, in which the sitter is depicted with the attributes of his or her patron saint, were particularly popular at this period. On the reverse is a depiction of Saint Sebastian in grisaille, identifiable by the bow and arrows.